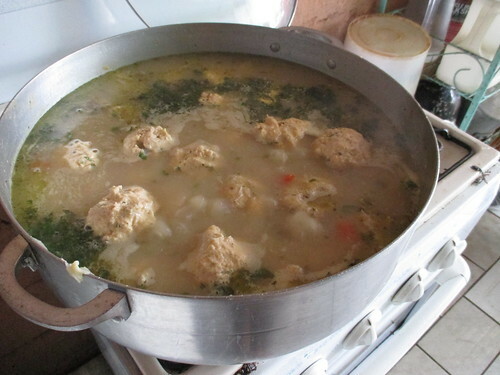 One Saturday a few weeks back I planned a date with Doña Amanda (my Batahola mother) to make Sopa de Albondigas, a traditional Nicaraguan soup that consists of chicken, vegetables and corn-based dumplings. 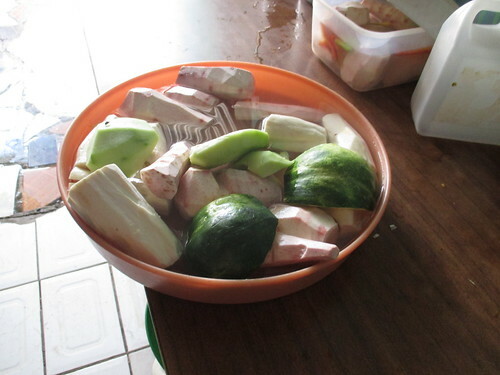 Since first coming to Nicaragua, one of the foods I was most amazed by was the soup. In the U.S., the majority of soup we consume comes from a can…or most of the ingredients are highly processed. 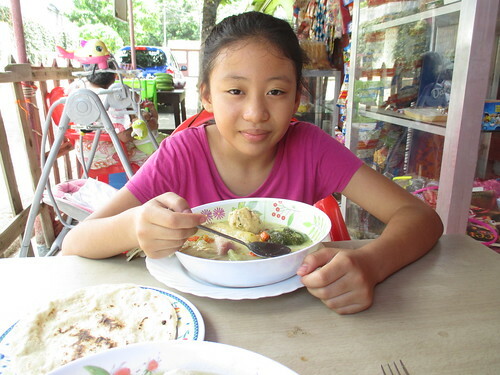 But here the soup is made with large chunks of fresh vegetables and herbs and most commonly a chicken leg, beef or if you’re feeling more adventurous “mondongo” aka diced cow or pig stomach. Can’t say I’ve ventured to try this one, but I have found a great appreciation for the labor of love that Nicaraguans put into their food, especially their soups. So here is a recipe if you ever want to try your hand at Nicaraguan cuisine. Other vegetables of your choice: squash, yucca, potatoes, carrots, corn on the cob, plaintains…or anything else you’d like! 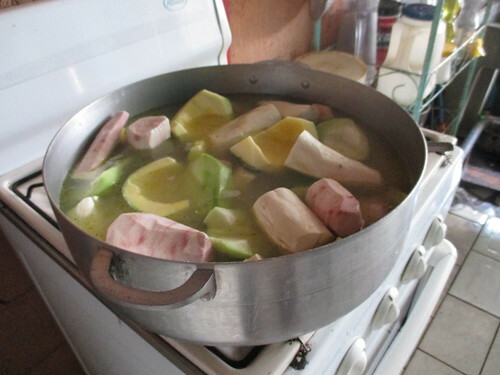 In this recipe we used quequisque (similar to a potato), ayote, chayote (two forms of squash) and yucca. Remove the skin of the chicken and put it to marinate in lime juice. While it’s marinating you can begin to peel the vegetables. Some forms of squash you can leave the skin on. Cut them into large pieces, making sure there are enough for at least one piece of each vegetable for each serving. Rinse off the chicken and put it in a large pot, cover it with water and bring it to a boil. Meanwhile slice the onions and peppers and remove the skins from the garlic. Leave the garlic pieces whole and add them to the hot water along with the onion, pepper, chicken bouillon and salt. When the water has come to a boil (after about 35 minutes), you can add the vegetables and more water until all of the vegetables are covered. Leave for another 15-20 minutes (or until chicken is well cooked) and remove the chicken breasts to begin the process of making the dumplings. While you are waiting you can begin to mix the dough for the dumplings. We bought some tortilla dough that was already made from fresh corn down the street. But you can make an imitation of this with corn flour (Maseca) and water. You’ll have to guess how much to make, but it would probably measure out to about 20 servings of tortillas. While the chicken is cooling, juice about 4-5 limes, wash and chop up mint and cilantro (it’s not necessary to remove stems). Pull apart the chicken into small pieces. 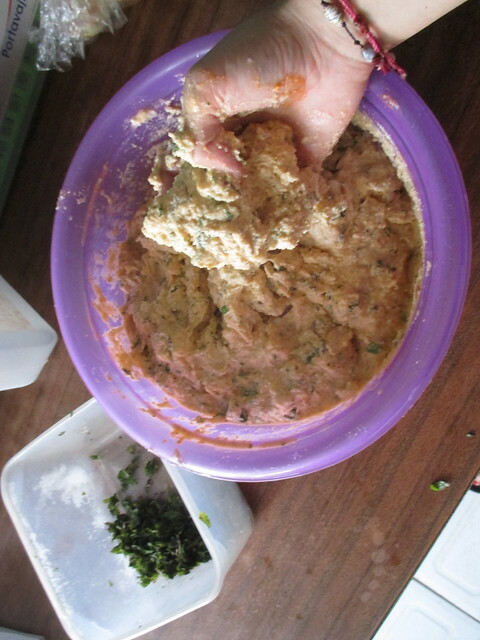 Take the corn dough and add a cup of water, 1/2 of the lime juice, 1/2 of the mint and cilantro and chicken. Mix together until the dough is sticky and can form into balls. More water may be needed to get the right consistency. We also added achiote which is a natural red coloring agent (optional). When the soup is boiling well and the vegetables are getting close to being done. Form balls out of the dumpling dough and begin to drop them into the boiling soup. Make enough for about 3 dumplings for each serving. If you run out of space you can take out some of the vegetables and chicken legs to make room for the dumplings to cook. Especially if some of the vegetables are done so they don’t get overcooked. Leave about 3/4 to 1 cup of the dough for adding thickness to the soup a little later on. Add the rest of the lime juice, mint and cilantro to the soup and let it boil until the dumplings are finished cooking. Add some more water to the leftover dough and mix it into the soup for thickness. If needed you can add more salt, lime or aichote (for coloring). Serve the soup in large bowls along with a hot tortilla and rice if desired. Enjoy! 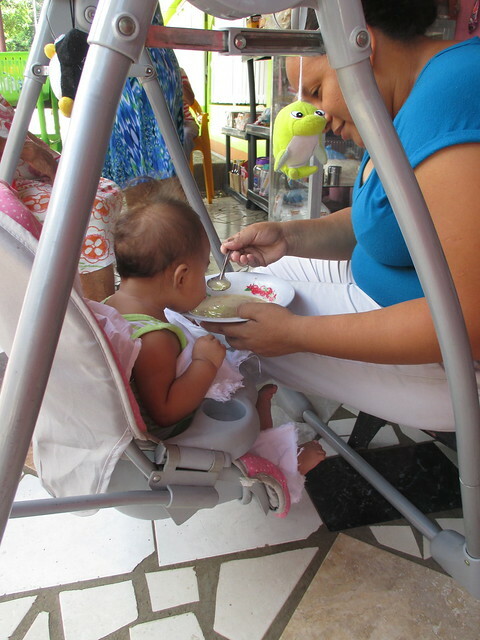 Alondra and baby Ruth enjoying their soup! 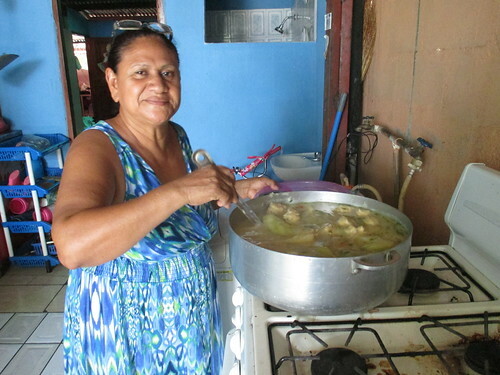 This entry was posted in Uncategorized and tagged cuisine, Nicaragua, recipes, Sopa de Albondigas, Soup, traditional food by bataholavolunteers. Bookmark the permalink.